After surviving the Hunger Games-like Testing, Eva becomes the Aerie's first female Archon. The second installment of the Books of Eva continue the harrowing struggle between past and present, Aerie and Boundary. Eva is the first Maiden in Aerie history to train as Archon, the sacred leader of New North. All eyes are watching. Although she is betrothed to Jasper, she still finds herself drawn to Lukas, a Boundary dweller and former servant who may know who killed her twin brother. Eva's relationship with Lukas is forbidden. And his conviction that she is the Angakkuq, a mystical figure destined to destroy the Aerie, is even more dangerous. On her very first Archon expedition, she uncovers the Genesis, the legendary ship that brought the Founders to the New North. Its contents shatter the world Eva has known. Now she may be the only one--as both Archon and Angakkuq--who can prevent a war that will destroy what is left of human civilization. Heather Terrell worked as a commercial litigator in New York City for over ten years, but she has always been obsessed with myth, lore, and the gap between history and the truth. This interest has led to several loosely factual historical novels (The Chrysalis, The Map Thief, Brigid of Kildare) and the pure-lore Fallen Angel series. 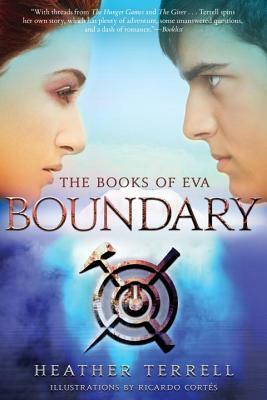 Boundary is the companion to Relic and the second installment of The Books of Eva. She lives in Pittsburgh with her family. Visit her online at www.heatherterrell.com. "Heather Terrell excavates a richly realized and adventurous world from the iced-over wreck of our own." "Adult author Terrell, in her books for teens, weaves fresh complexity... with smart, thoughtful, and resourceful heroines." "Part post-apocalyptic fiction and part high fantasy, Relic is the beginning of a trilogy that is written artfully and with a voice you will not soon forget. Delicately weaving in elements of Inuit culture as well as elements you might find in Game of Thrones, Heather Terrell creates a world that is as intricate as it is icy. The intrigue and mystery make it a page-turner, and the rich and complex characters make it hard to forget. I cannot wait for the sequel!" "Technology is a fragile thing and another Dark Age could be closer than you think.... the world built in Relic is unique and has a rich allegorical quality." "A suspenseful novel that’s as smart and well written as it is inventive, original, and surprising."